To celebrate our survival over exams, presentations, and papers, a friend and I decided to get away for a weekend. 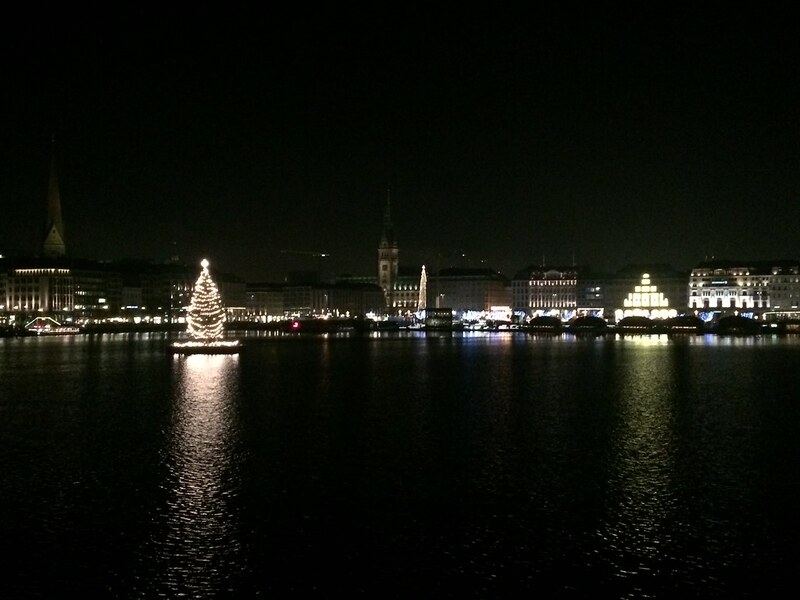 We wanted to see something different and discover some new Christmas markets. Coming from California, my friend had never been to the Venice of Northern Europe and so we decided. A great advantage of living in Berlin are the endless connections of long distance busses towards every major city in Europe. So we ended up taking the bus for 10€ one way, which took us 3.5 hours. Sure, taking the train takes a third of the time but also it is also five times as expensive (and we’re students after all). We stayed in two adorable rooms in an old villa that we found via Airbnb. Booking a room for two can make Airbnb actually cheaper than any hostel but there are obvious up- and downsides to both choices. Although it was not the first thing we did, taking a free walking tour through the city is definitely the best to cover all the famous sites of Hamburg. I love those free walking tours. The tour guides are always locals and super fun to be around. The company starts walking tours in more and more cities all over Europe, so whenever I get to a new city, I always check if they offer a tour there. In Hamburg, they offer two different tours: One through the historic center of the city and one around the harbor and the famous Reeperbahn. We decided to join the historic tour and have a look at the rest by ourselves. Since I’m writing this post a million years too late, I can’t remember the actual route, but it was perfect. The tour ends in front of the renowned St. Michaelis church, commonly called “Michel”. 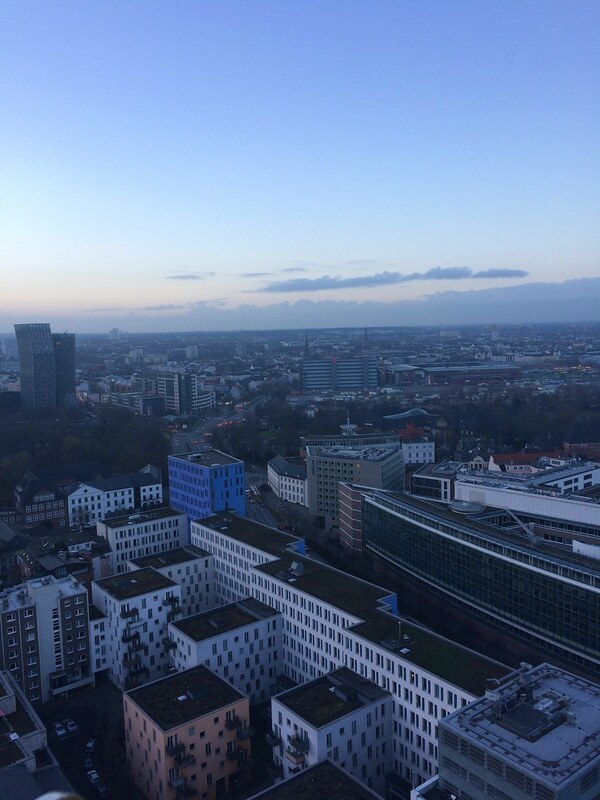 It has one of the highest steeples of the city and, therefore, offers the best view over Hamburg. For 4€, you can either walk up the 452 steps or take the elevator and enjoy the view over the harbor and the city. The Reeperbahn in St. Pauli is one of the areas with a vibrant nightlife and also the well-known red light district of the city. Since my friend and I have never been there, we decided to be tourists and have a look. I can not say a lot about the area since we didn’t stay there for a long time. However, I prefer the other nightlife center of Hamburg, called Sternschanze since the atmosphere is more relaxed and there are fewer tourists than on the Reeperbahn. My favorite spot to hang out during the day is the Jungfernstieg at the lake Innenalster. It is located in the center of the city, maybe two walking minutes away from the Rathaus (city hall) and surrounded by the most upscale hotels and shops of the city. It is always nice to take a walk around the lake and through the small streets with all the shops and restaurants. Since we went there around Christmas, everything was beautifully decorated. Therefore, the walk around the lake was equally enjoyable at night. Did I miss anything? 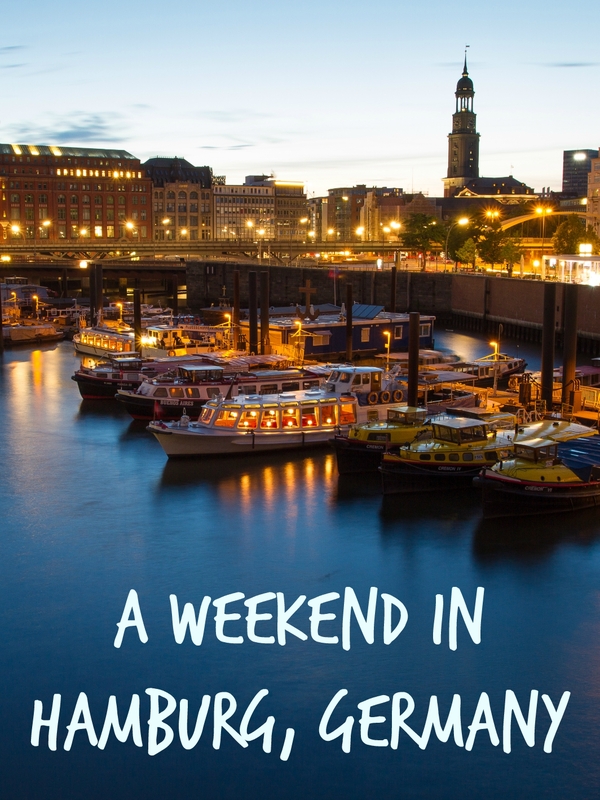 What are your favorite spots in Hamburg? Kaum zu fassen, dass ich in Hamburg geboren bin und absolut 0Erinnerungen mehr an diese schöne Stadt habe ! 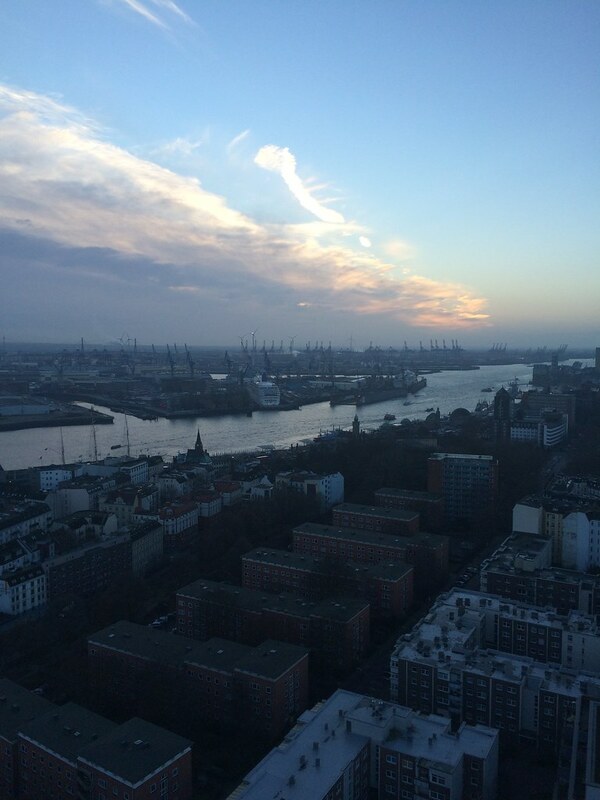 Love Hamburg! I spent a month there housesitting for a woman who was visiting the States! Lovely pictures and story – thanks for sharing. What an awesome experience. The city hall looks so cool and I love the Christmas decorations. I don’t know if I’ll ever make it that far from California, but I would love to visit someday. That sounds lovely. It looks like you had a lot of fun. The views were stunning too! 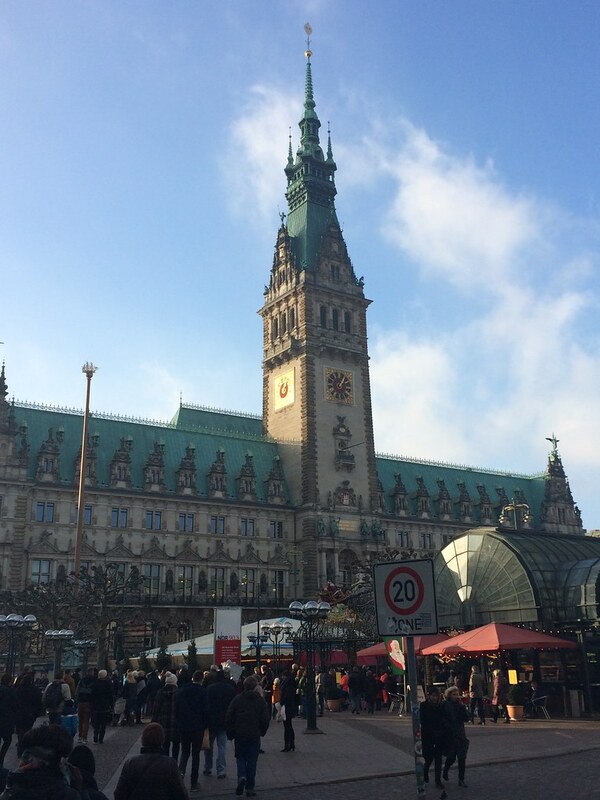 I enjoyed this post about your trip to Hamburg. I haven’t actually been there yet but I have a number of students from there and they keep saying that I should visit. Did you visit the chocolate factory when you were there? It’s already on my list of places I want to go! Have a great week and I look forward to reading more of your blog. Really vibrant city – strangest thing I did there was take a boat out to Helgoland for the day. Great trip but really random! Hi Juliet, stopping by from the Sunday Blog Hop. Thank you for linking up this post. I’ve never been to Germany, I have only been as far (I’m in the States) as Estonia. Love your photos, it looks like a place I’d enjoy too! Thank you for stopping by 🙂 Glad you liked it. I’m sure one day you’ll make it to Germany!